Sometime in the early eighties me and my brothers owned a collection of Disney books, including a magic book called “La Magia de Mickey Mouse”. I read it many times even though I did not understand all the tricks. This collection of books was passed on to my younger cousin Rosy in the late eighties. 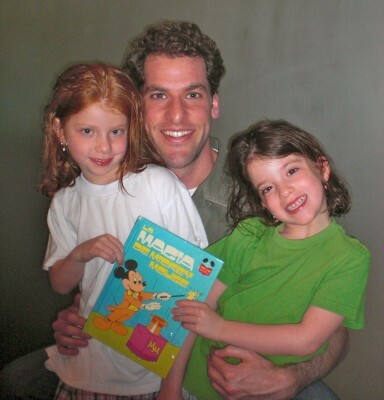 I’m not sure where it went from there but eventually they ended up in Miami with my two nieces, Joelle and Liat. Since I’m the cool uncle, the one who has taken the classic “coin out of the ear” sleigh of hand to the next level – among other breath-taking and mesmerizing tricks – it was me that Joelle thought of when she found and read the book. I’m now supposed to read it and do the tricks to them. At least now I think I understand all the tricks on the book. Little do they know that I had already owned and read that book long before they were born. I don’t think I’m going to be the one telling them this. Maybe they’ll stumble upon this post years into the future and everything will be ruined. The book itself is actually in surprisingly good condition, maybe that’s the real magic trick. If you are the cool uncle that makes Moi the ______ uncle? Yo tenia esa colección también… muy buenos! Están padrísimas tus sobrinas y lo mejor de todo: ¡Te quieren mucho! la verdad, eres lo máximo como tío y ellas saben!